Japan’s third largest city Osaka was dubbed the 'nation's kitchen' due to its historical role as a rice trading hub. It's now a major commercial centre that blends towering skyscrapers and contemporary consumerism with attractive eco-friendly spaces, historic shrines, temples, castles and tantalising dining options. Boasting a warm climate, Osaka is a comfortable winter destination and you’ll certainly need t-shirts for a summer visit. At its peak Osaka reaches an average of 31.6 degrees (August) and at its coolest (January) it averages 9.5°C. Osaka citizens pride themselves on having a more down-to-earth attitude than those from the capital and their pragmatic approach to life is reflected in the heavily commercial vibe of their city. And while Osaka may not be the most aesthetically pleasing of Japan’s cities, it doesn’t lack for entertainment options. 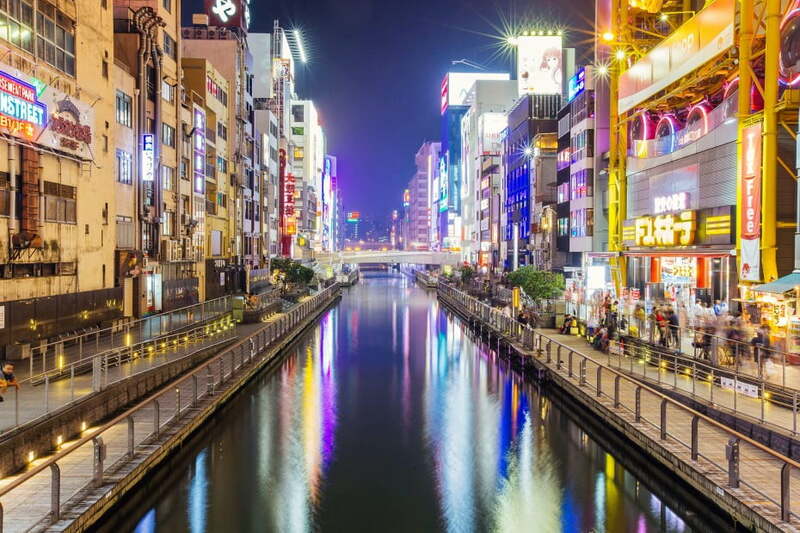 Check out the numerous outstanding food stalls, the serenity of Castle Park, the towering 40 level Umeda Sky Building, and lengthy Tenjimbashisuji Shopping Street for a dose of retail bingeing. If you’re seeking entertainment for the entire family, stop in at Universal Studios Japan or the renowned Osaka Aquarium Kaiyukan. If you’re seeking entertainment for the entire family, stop in at Universal Studios Japan or the renowned Osaka Aquarium Kaiyukan. Often regarded as the best in Asia, you’ll be wowed by an exotic array of sea life such as the Oriental small-clawed otter, Japanese giant salamander, dolphins and much more. There’s also a host of excellent day trip options; a visit to the eight storey Osaka castle is widely considered a ‘must do.’ There you’ll find a masterpiece of traditional Japanese architecture with a dedicated museum and spectacular views. Or for a sombre cultural experience, take the bullet train to Hiroshima and then boat to Miyajima Island to see the Peace Memorial Park and Itsukushima Shrine.